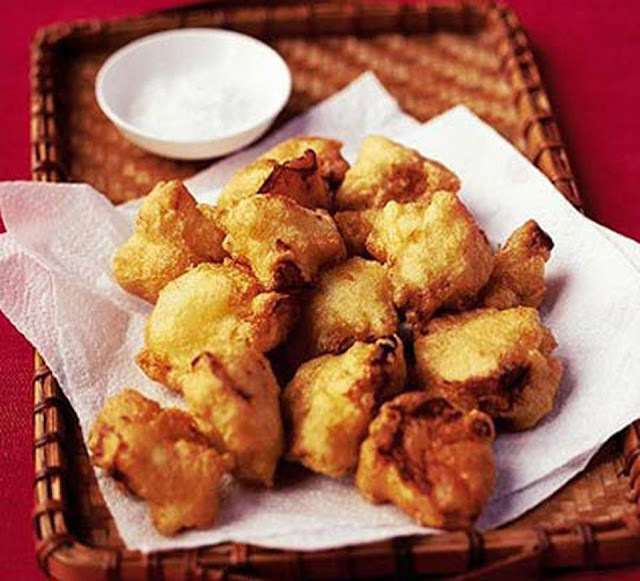 Tempura is made by battering and deep-frying fish and vegetables. While not a part of classic sushi, modern sushi chefs have created tempura sushi by rolling a piece of tempura with rice and seaweed. Chicken, shrimp, squid and sweet potato are some of the types of tempura rolls that can be found. Cauliflower gets its deserved moment in the spotlight in this Japanese-style snack For a difference instead of boiling or steaming cauliflower florets, toss them in some olive oil, sprinkle with paprika and roast in a hot oven for 30 mins until cooked and crispy. Cook the cauliflower in boiling water for 2 minutes. Tip into a colander, rinse under the cold tap, drain well and set aside. Put the flour in a large bowl with a pinch of salt. Whisk the egg yolks and 175ml iced water together. whisk into the flour with the oil to make a smooth batter. In a separate, clean bowl whisk the egg whites until stiff, then fold into the batter. Heat the oil in a deep fryer or large wok to 190°C. Coat some of the cauliflower in the batter use a slotted spoon to carefully lift into the hot oil. Deep-fry the cauliflower for 2-3 mins until golden and puffy. Drain on kitchen towel and continue with the rest in batches. Sprinkle the cauliflower with salt. Serve with a bowl of aïoli.